Brussel sprouts can get a bad rap, but I think these little members of the cabbage family are delicious – especially slow roasted with a drizzle of olive oil. This week I wanted to try something different with them though, so I decided to use them in Martha Stewart’s Shiitake Nori Rolls recipe (ignore the photo within the link, it is incorrect!) in place of the cabbage. 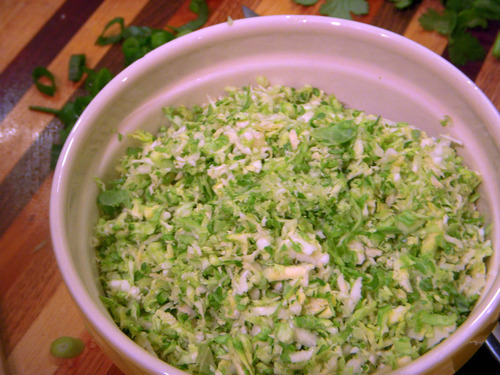 Shredded brussel sprouts, ready to be lightly cooked in olive oil with onion and garlic. The final result – a little messy, but very tasty. I was lazy (ie hungry and feeling under the weather) so I didn’t take the time to toast my nori sheets. Do as I say, and not as I do – toast your nori sheets! Your rolls will slice cleanly and look prettier than mine do. 1) Make the dipping sauce: Combine 1/2 C veggie broth, lime juice, shoyu, and cilantro to taste. Top with some scallions. Set aside. 2) Bring a medium pot of water to a boil. Add noodles; cook according to package instructions. Drain. Rinse with cold water; drain again. Transfer to a medium bowl; toss with sesame oil and cilantro to taste. Set aside. 3) Heat olive oil in a large skillet over medium-high heat until hot but not smoking. Stir in shallots (or onion) and garlic. Cook, stirring occasionally, until shallots/onions begin to brown, about 2 minutes. 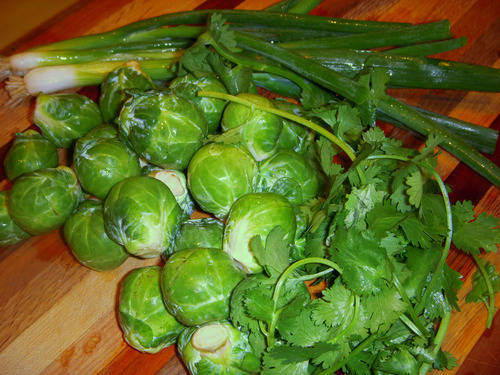 Add brussel sprouts, and toss to combine. Reduce heat to medium. Cook, stirring occasionally, until brussel sprouts wilt slightly, 2 minutes. If desired, add remaining veggie broth and shoyu to taste. Cover, and cook, stirring occasionally, until brussel sprouts are tender, about 5 minutes. Stir in sliced scallions; set aside. 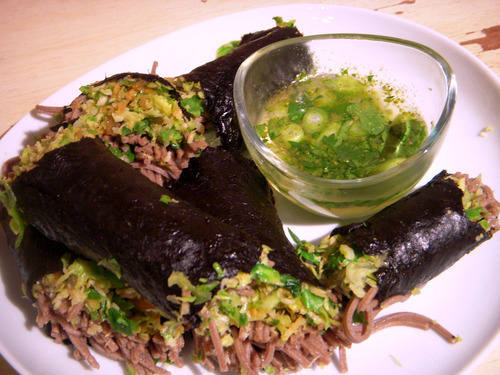 5) Working with 1 toasted sheet at a time, put 1/6 of the noodles along 1 edge of the nori, leaving a 1-inch border. Top with 1/6 of the brussel sprout mixture. Starting at the side with the filling, roll up sheet, enclosing filling. Repeat process with remaining sheets, noodles, and cabbage mixture. Cut each roll on the diagonal into 2 pieces. Serve with dipping sauce. *In all honesty, although my dipping sauce was fine, I would stick with Martha’s as written – my budget just didn’t allow for purchasing dried shiitake mushrooms. This entry was posted in In the Kitchen (recipes & more) and tagged brussel sprouts, cooking, farmer's market, fresh, fresh food, lindsay jean hard, local food, Real Time Farms. Bookmark the permalink.